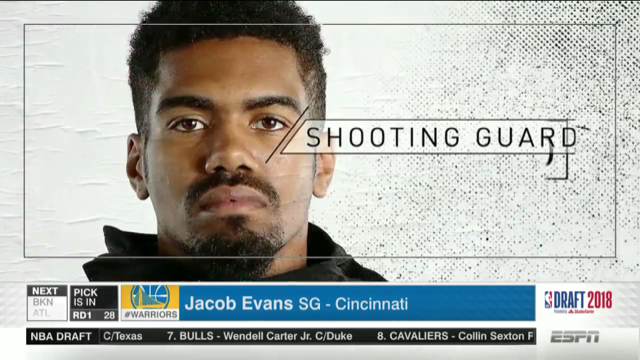 On Thursday night in the NBA Draft the reigning world champions the Golden State Warriors selected University of Cincinnati’s Jacob Evans III with their only pick in the draft. I for one am very excited JEIII was selected by a top-notch organization. Cincinnati sports fans who follow the Cleveland Cavaliers won’t be so thrilled with where he landed but they can get over it. Jacob “Big Game Jake” as Warrior fans will soon get to know him as is a great fit here. His pre-draft prospect card says he’s a 3 and D wing that can guard multiple positions. He has a long wingspan and has an extremely high basketball IQ. I’m not saying anything Bearcats fans don’t already know. Jake did a lot of great things at UC and I believe he’ll be a great Bearcat ambassador in the NBA now too. Glancing at his career numbers at UC you probably won’t be too impressed. He put up respectable numbers but nothing that even matched the former UC great and undrafted Chicago Bulls player Sean Kilpatrick. In his defense though the team he played on was much better overall. JEIII played along side 2017-’18 AAC POY Gary Clark all three years, not to mention Kyle Washington, Troy Caupain, and underclassmen/ the future Jarron Cumberland. Jake did what he had to do to make his team win and that’s exactly what the did, win. During Jake’s time at UC (3 years) the team went an almost unbelievable 85-22 and 65-11 his sophomore and junior year. 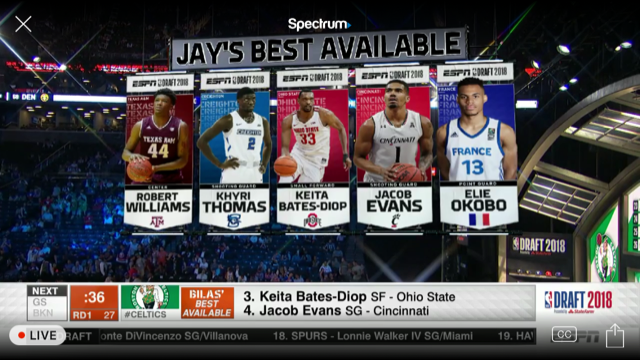 Evans and the Bearcats could never make it over the hump in the NCAA Tournament though. They failed to make it out of the first round each year and none more devastating than this years loss to Nevada in the second round. One the Bearcats looked to have locked up early in the second half. I’d have to say this is the first draft I have paid attention to since SK was supposedly going to be drafted several years back and it’s the first draft I followed along with on twitter. I have to say it was wildly entertaining. Some started to panic though when we got to the mid twenties and Jake was still on the board. The writing was on the wall though for Golden State taking Jake. A team rep had been to watch Jake on three separate occasions this past season. He also worked out for them twice, the second coming just the day before the draft. 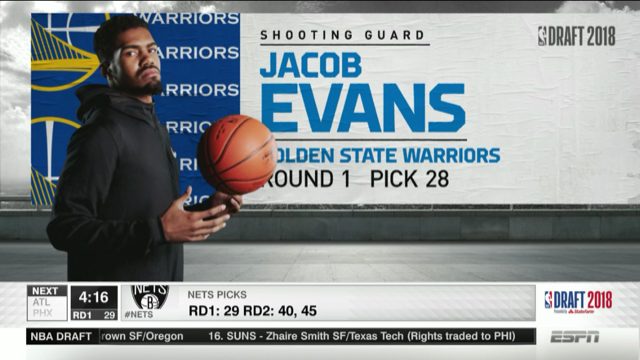 Source: The Warriors are locked on Jacob Evans at No. 29. Realizing Jake won’t be wearing that Cincinnati jersey next year hurts but I can’t wait to see him play for the Champs. He has that winning mentality and over the past three seasons it’s hard to pick a favorite moment I had of Jake but if I had to pick one it would have to be the buzzer beater over the Man Bun against Houston at home. I got chills watching it again, full highlights below. Not impressive enough? How about that time in Wichita when Jacob Evans III carried the Bearcats to victory on just one leg? So #DubNation are you ready for the next Splash Brother with some Cajun flavor? He’s going to fit in just fine with the boys! All I need to know is which Evans III Golden State jersey I should I get?